Now The End Begins are reporting that the NFL has just made the stunning announcement that beginning in the 2014 football season, all players will receive RFID tracking chips that will be integrated into their shoulder pads. Their every movement will be tracked, cataloged and analyzed in massive computer systems, with the stats being spat back out in real-time. Overnight, millions of rapid sports fans the world over will be completely sold on the idea of human-wearable RFID microchip technology. From there, it will be the shortest of leaps to implanting those chips into the bodies of the players. The Devil is very smart, and his plan is right on schedule. For the initial rollout, the RFID system will be used in 17 of the NFL’s 31 stadiums. (Astute sports fans will note that the NFL has 32 teams, but the Giants and the Jets share the MetLife Stadium in New Jersey.) 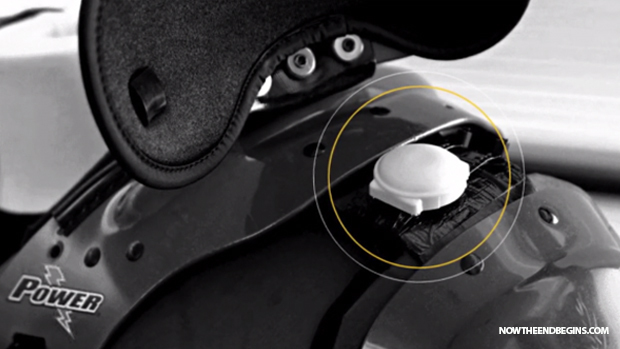 When squaring off in these stadiums, players will actually be tracked by two RFID chips — one in each shoulder pad. Data is broadcast in real-time to provide information on positioning, velocity, direction, distance run and even force-of-impact. 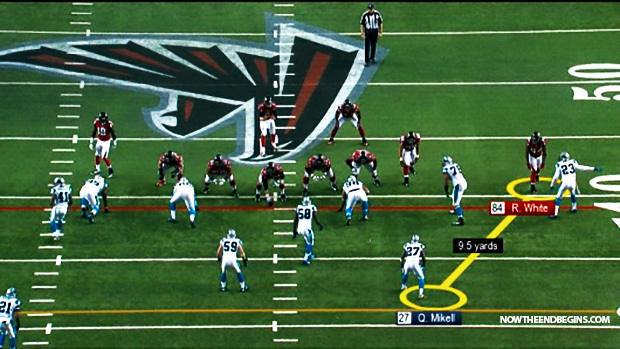 All of that data is instantly analyzed by the NFL’s MotionWorks system, which then generates statistics for every play. The data can also be instantly incorporated into the visual elements of the TV broadcast. In fact, the MotionWorks system crunches the numbers so quickly that graphics can be added within the broadcast’s standard two-second delay. The upshot of all this is that viewers — not to mention coaches and team executives — will be able to track every players’ movement in the often chaotic scrum of the typical NFL football game. When a blocking assignment is missed or a receiver is suddenly wide open in the end zone, fans will know precisely which player screwed up, and when and where. This partnership is an evolution of the NFL’s initiative to test player tracking in-game, and will be the broadest deployment of a system to date. Zebra’s sports solution will be installed in the 15 stadiums that host Thursday Night Football games (Atlanta, Baltimore, Carolina, Chicago, Cincinnati, Denver, Green Bay, Houston, Jacksonville, Miami, New England, Oakland, San Francisco, St. Louis, Washington) as well as Detroit and New Orleans, and will capture information from all 32 teams. This amazing revelation shows you how very close we are to the Rapture of the Church of Jesus Christ, and how very close those who will be left behind are to entering the time of the Great Tribulation.